Listening to: Praise. Earlier today, I was at my local Starbucks getting some Me/writing time in. Near me was a teenage being tutored. I happen to hear her say to her tutor that she never thought she could be tutored or really enjoy it. Now she does. Looking forward to: Every day. 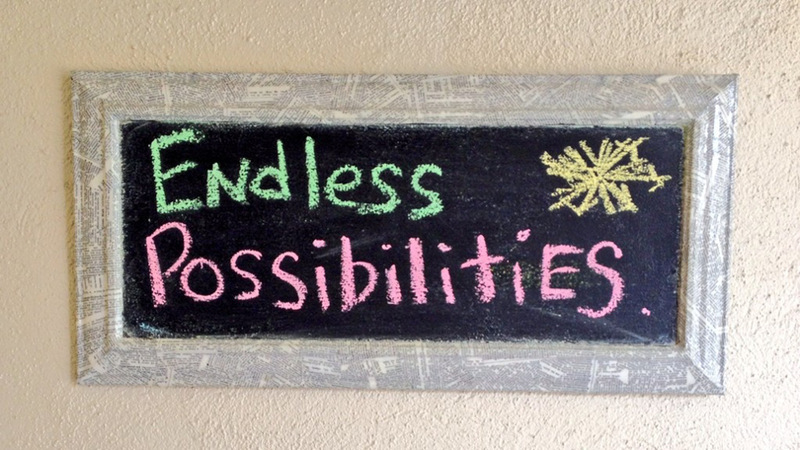 It kind of goes with my black board quote photo: “Endless Possibilities”. Each day offers us something new to learn. To experience. To love. If you get the chance, every day offers something to look forward to. If you think about it, children bring you endless possibilities because you never know where they will take you, where they will want to go, or what they will be become. At the same time, you too have endless possibilities. I never thought I would have twins or would marry a man from Germany and be able to travel there! We set the sails but it is the wind that takes us. Sam Update: Joined his first club. Drum role..it’s the Lego Club! He even has the Lego Club schedule flyer handing on his wall above his bed. He also loves to tell me his plans. He likes to tell me what is suppose to happen tomorrow, the upcoming weekend, what we need to do, who will be there, etc. Like mother, like son. Twin Update: Sweet Sixteen Months. This month the girls turned the Sweet Sixteen Months and it has been living up to its name. The girls are so sweet, funny, and caring. They love to eat. They love to hold their stuff animal while they explore the backyard. They love to dance, play with water, and play together. They also love to take things from each other. When they are both hungry or thirsty, they both love coming at me, pulling at me, trying to tell me what they want. Then once I give them something to eat or drink, they calm down, laugh and run off to play. It reminds me of the endless things I can and need to teach them while I’m still home with them.